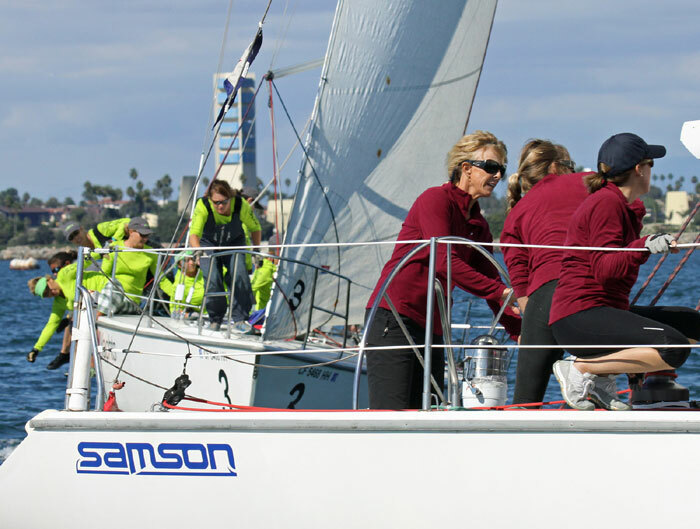 LONG BEACH — Annie Gardner of San Diego Yacht Club became a four-time winner of the Linda Elias Memorial Women’s One-Design Challenge regatta Oct. 21, an event organized and sponsored by the Long Beach/Los Angeles Women’s Sailing Association and hosted by Long Beach Yacht Club. In the 21st running of the regatta, teams sailed aboard Long Beach Sailing Foundation’s fleet of identical Catalina 37s — the same purpose-built one-design boats raced in Congressional Cup competition each year. In the closely fought final race of the regatta, Gardner and Southwestern Yacht Club’s Colleen Cooke — looking to get a “three-peat” adding to her 2010 and 2011 victories — were no more than a boat-length apart. If Cooke crossed the line first, she would win the regatta — and if Gardner crossed first, she would win on a tiebreaker. But Gardner was ahead of Cooke, and she kept it that way — adding to her list of victories in 1997, 2005 and 2006. With a brief fall storm moving through Southern California over the race weekend, Sunday dawned with rain turning to cool overcast skies and a breeze of about 4 to 7 knots that couldn’t make up its mind which way it wanted to blow. “This weekend was so hard,” Gardner said. “We would go right, and the wind would go left. It felt like a crap shoot trying to guess the wind direction. Gardner gave full credit to her crew: Stacey Szabo, tactician; Jessica Diaz, main; Betty Sherman, trim; Sandy Vissman, trim; Diane Waterberry, grinder; Kathy O’Brien, pit; Kirsten Stahl, floater; Alexis Steele, squirrel; Lisa Marie Terhaar, mast; and Julie Mitchell, bow. For the most part, Gardner’s team had not sailed together as a team before. “Last week, we put the crew together,” Gardner said. “The front, middle and cockpit positions were really good. We just had to worry about the trim. At the end of the day Saturday, Cooke’s Southwestern YC team was in fourth place, six points behind leader Gardner. A third win wasn’t out of reach, but they had their work cut out for them. At a little after 9 a.m. Sunday, when some of the other teams were only just arriving at their boats to get them rigged and ready for the day, Team Southwestern YC was motoring out of the Alamitos channel to begin their morning practice. “We felt a lot of pressure to do a three-peat,” Cooke said, “and we felt like we had a target on our back. “Last night, sitting in fourth place, we knew the top three teams were San Diego, Newport Harbor and ourselves,” she said. “Today, my team fought and fought, and kept fighting. We were only a sliver away … but we had a bad takedown in the last race, and that’s all it takes. California Yacht Club’s Denise George was the manager for Team Cal YC, which took third place in the regatta after a second-place spot at the end of the first day. Team member Kelly Fennessy talked about the makeup of the team. “We have veteran sailors on our team, mixed with younger members new to the team,” Fennessy said. “It’s about a 50/50 split. Allie Blecher, 2010 Intercollegiate Sailing Association Women’s National Champion, handled the driving duties for the team. “It’s always a pleasure to sail with these girls,” Blecher said. “They’re great sailors and have experience on these boats. Gardner was awarded the perpetual Linda Elias Memorial Women’s One-Design Challenge trophy, donated by Al and Vicki Shultz; and the Catalina 37 Women’s One-Design Challenge, Long Beach/Los Angeles Women’s Sailing Association trophy. She also received a $1,000 scholarship check from the Linda Elias Sailing Scholarship. New this year was a special donation of $500 to the second place finisher, Colleen Cooke, from the late Linda Elias’ surviving husband, Michael Elias. The Women’s One-Design event began 20 years ago and Linda Elias — the namesake for the current regatta — won the championship three of the first five years. Elias died in 2003, and the Long Beach/Los Angeles Women’s Sailing Association rededicated the event in her memory. Final results are: 1st: Annie Gardner, San Diego YC, 1-1-4-3-7-3-1, 20 points; 2nd: Colleen Cooke, Southwestern YC, 3-3-5-4-2-1-2, 20; 3rd: Allie Blecher, California YC, 7-2-1-1-4-4-3, 22; 4th: Gale Pinckney, Newport Harbor YC, 2-4-3-7-1-2-8, 27; 5th: Judy-Rae Karlsen, Sea Gals, 4-6-2-2-5-7-5, 31; 6th: Karyn Jones, Women’s Sailing Association/Santa Monica Bay, 5-7-6-5-3-5-4, 35; 7th: Jane Hoffner, Team Pilikia, 6-5-7-8-6-8-6, 46; 8th: Cheryl Lynch, Long Beach/Los Angeles Women’s Sailing Association, 8-8-8-6-8-6-7, 51.